Dead Sea Scrolls - Based on our best estimates and the evidence that exists, sometime after the Maccabean Revolt, a Jewish sect broke away from mainstream Judaism and fled into the Judean wilderness to prepare for the "end of days". 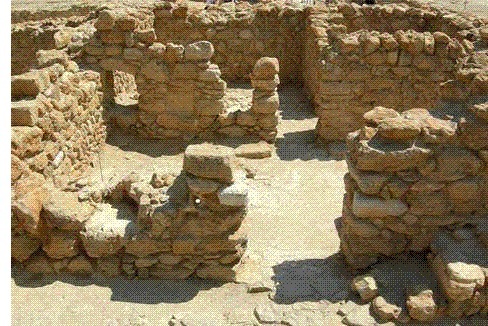 They ended up at a place near the Dead Sea that later became known as Khirbet Qumran. They were known as the Essenes, and the actions of Antiochus IV Epiphanes and the subsequent revolt of the Maccabees must have convinced them that the end was near. When the Dead Sea Scrolls were first discovered in 1947 (see Dead Sea Scrolls found at the end of the chart) and excavations on the site began thereafter, much more than just the ancient scrolls were found. Dr. Laukester Harding of the Jordan Department of Antiquites and Pere Roland De Vaux of the Dominican Bible School of Jerusalem began a series of five archaeological campaigns starting in 1951. A 15,000 square foot complex built to house an entire community was uncovered. It contained a defense tower, a culinary department, a great dining and assembly hall, a pantry, laundry room, storerooms, spacious courts, a water system which brought water to the complex from a nearby waterfall and large cisterns to collect the water. Nearby there were stables for horses and livestock, a pottery workshop, pools for bathing and baptizing and even a cemetery containing over a thousand graves. The complex also contained a 43x13 foot (13x4m) scriptorium from which the many hundreds of scrolls were written. The discovery of some 700 coins covering close to a 200 year period allowed the archaeologists to date the use of the complex from about 130 B.C. to 68 A.D.. No where in any of the scrolls do the authors identify themselves, but the evidence almost certainly links them to the "people of the scrolls" or the Essenes. The writings of Josephus, Pliny the Elder and Philo of Alexandria all identify this group by name, which split from orthodox Judaism to remove themselves and 'go to the desert to prepare the way of the Lord." Whereas the beginning date of the Essenes' occupancy is not for certain, the ending of it is much more firm. It came with the Roman suppression of the Jewish revolt between the years 66 and 70 A.D. (see Jerusalem destroyed on the Roman timeline). The scrolls were sealed up and hidden, the complex was destroyed by the Roman Tenth Legion, and the Essenes fled.